Wash and cut the lettuce. 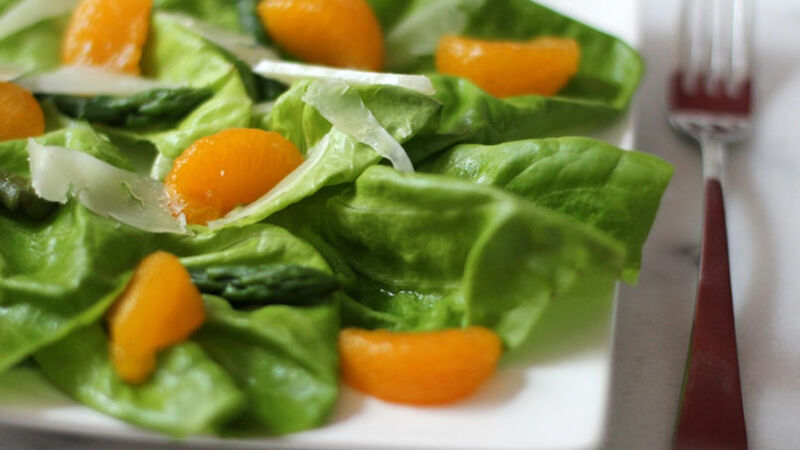 Drain mandarins and save the juice to make a balsamic vinaigrette. Cook asparagus for 5-7 minutes, I like them crunchy so I add them to boiling water and then I turn off the heat. I leave them for about 5 minutes and then I drain them. I also like to sauté them on a grill with a little cooking spray. Add cooked asparagus and other ingredients to a bowl. Mix mandarin juice, balsamic vinegar, olive oil and salt and pepper to taste. Drizzle over salad and serve. You can serve the salad in individual bowls and accompany with a chicken breast or salmon. Add blackberries or strawberries to the salad. You can substitute the Manchego cheese for goat cheese or fresh mozzarella. Butter lettuce is known as a “buttery” variety with a nice taste between bitter and sweet, which makes it perfect to serve with fruits and/or cheese. For this occasion, I prepared it with fresh asparagus, mandarins and Manchego cheese. I like to buy this variety of lettuce because it can be sautéed with other vegetables in a wok, without losing its essence.